Started on June the 1st 2017, the GASVESSEL project has reached its first year of activity and the work scheduled for these 12 months has been completed. In this article, project coordinator Navalprogetti is summarizing the achievements and results of GASVESSEL’s first year and providing an outlook on the next steps. During this period, 3 milestones have been reached and a total of 10 deliverables already submitted to the European Commission. The Consortium of 13 Partners is well-knit and the Companies are working closely together with one another. 2 General meetings have been organized with the presence of all Partners and by the end of Month 18 the third one will occur. Partners are constantly in touch through web-conferences and face-to-face meetings to complete the tasks, to share ideas, to develop the project in the right and timely way. The foreseen three CNG utilization scenarios have been identified and reported and the Decision Support Model functionality demonstrated, thus completing timely the Work Package 2 on month 12. 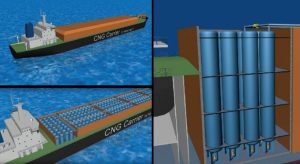 Work Package 3 (Experimental Pilot Line Design), Work Package 4 (Experimental Pilot Line construction, installation, making operative and cylinders testing) and Work Package 5 (CNG Ships design) are well progressing according to the Work Plan. On mid-July a meeting is arranged in Kyiv at VTG between the Partners involved in Work Package 6, to better define the aspects relevant to offshore/onshore loading/unloading facilities. This will provide useful info to SINTEF Ocean and allow them to start the activities for Work Package 7 (Costs/Benefits Analysis). From a more practical point of view, the first set of technological tests on stainless steel and carbon fibre were successfully completed. 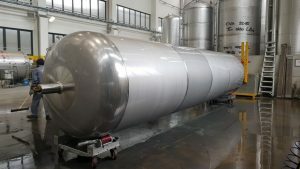 This allowed to define the material for the construction of the first liner, the core of the pressure cylinder, and to preliminarily define the type of carbon fibre and the impregnation and curing process. The first liner has been built and the construction of the hydroforming mould is nearly completed; the hydroforming pumps and equipment are ready. The hydroforming of the first liner will take place at the end of July and immediately after that, the technological test will be repeated on the hardened liner material and carbon fiber. This time technological tests will be officially attended by ABS, thereby launching Work Package 8. Hydroforming is the focal point of the GASVESSEL Project: we all remain looking forward to the first hydroforming to get confirmation of all our theoretical calculations and studies. If the results obtained from the initial official tests are positive, they will give the green light to the construction of the subsequent five liners in the course of the second half of this year, as expected. Partners are also involved in disseminating the project. GASVESSEL has been presented, just to quote some events, to the TRA2018 Conference in Wien (Austria), the EMGC in Nicosia (Cyprus), the NAV2018 Conference in Trieste (Italy), the FLAME2018 Conference in Amsterdam (Netherlands), through live presentations, brochure delivery, networking, round-tables, etc. Last but not least, the social network activity is growing day by day as the project progresses.